Gorgeous, one-owner custom ranch has everything you desire! Spacious, open floor plan offers stunning wood floors in kitchen w/granite, tile backsplash, stainless apps, expansive island, custom cabinetry, walk-in pantry & is open to breakfast area & great room w/built-ins & stone gas fireplace. Split bedroom plan w/master suite boasting lighted tray ceilings, 2 walk-in closets & en suite spa-like bath w/stunning dual vanities, tile floors, & tile surround separate tub & shower; bedrooms 2 & 3 have walk-in closets & full guest bath w/granite & tile. Separate laundry & drop zone w/tile. Amazing walkout lower level has wet bar w/granite, tile floor, stone surround backsplash & bar surround w/DW, refrigerator & custom cabinets; also rec room, family room, & game/area-perfect for entertaining! Lower level also offers 3rd full bath, 4th bed, bonus room (used as 5th bed), office w/French doors & storage. 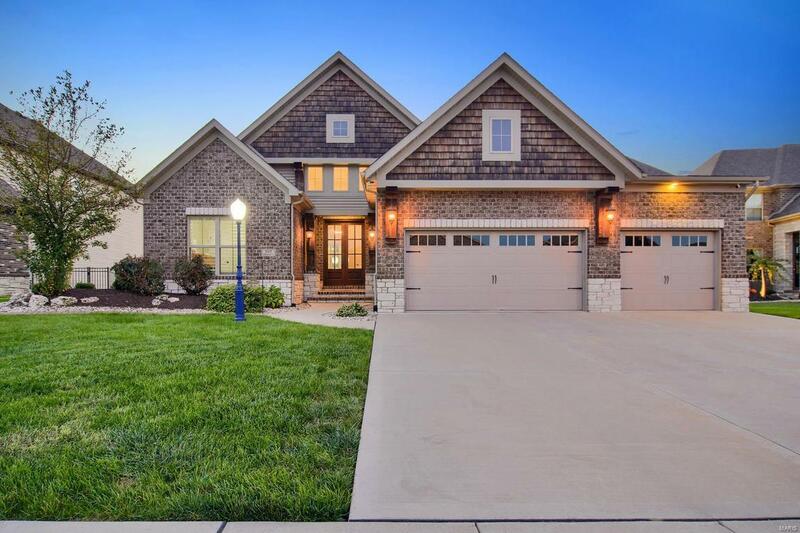 Outdoor space boasts oversize 3-car garage, sprinklers, patio & covered deck. Lot Dimensions: 85.25 X 141.71 IRR.